According to study, WordPress powered over 30% of the websites and the number is growing with the time. WordPress was started as a blogging platform but has become a full CMS that can be used for any kind of website. WordPress is no doubt the best and most used blogging platform. But I have seen many new bloggers who use blogger and ask why should I use WordPress while blogger is giving the similar features for free. Yes, It is good to start with blogger but after few months, you will surely wish to move to the WordPress. Moving your blog to WordPress costs only a domain and Hosting. But this little investment can also help you in earning good income from your blog. In this post, I am trying to give an answer to those bloggers who think that WordPress blogging is same as blogger.com blogging. I will try to answer one of the most asked question by new bloggers. 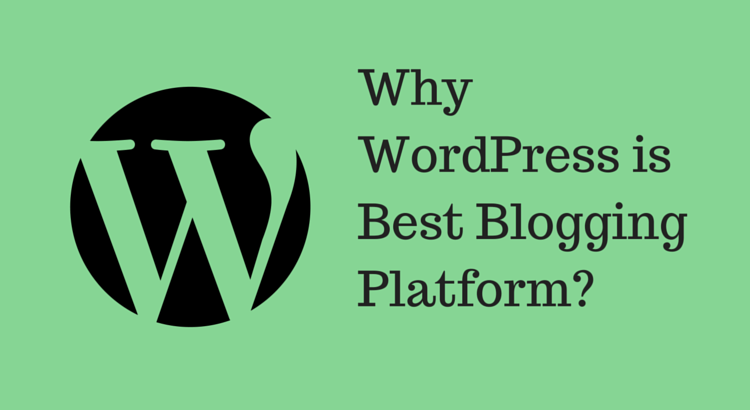 That question is “Why WordPress is Best Blogging Platform?”. I also started my blogging with Bloggers blogspot blogs. I still have 1 of my blogs running on blogger. But there are many essential SEO features which are missing in blogspot blogs. Although Google has added some SEO features to blogger service but those are not sufficient. There are various things which are important for blogging such as permalink editing, SEO settings, custom error page and use of plugins. When I came in touch with some professional bloggers, I switched to self-hosted WordPress blog. And I am satisfied with WordPress. For this you have to buy hosting (I recommend Bluehost) but you will surely start earning money to pay for hosting bills soon. If you are using blogger as your blogging platform, then one thing you must know. According to Google’s Terms and Conditions, Google is the main owner of your blog and it can delete your blogspot account without giving you any previous warning. It does not matter either you are using blogspot domain or custom domain. I have also faced the same problem with my blog and Google removed one of my blog by mistake which took more than 2 weeks to restore. As the blog was not so popular, I didn’t face any loss. But think if it was an established blog, it could ruin my earnings. If you use self-hosting WordPress blog, then you are the true owner of your blog. The only thing you need to do is pay your hosting invoice in time. And your blog will remain yours for the life time. You also have full control over your blog. You can do whatever you want. There is a wide range of Premium and free themes available which a blogger can use to make a good looking SEO friendly website. There are hundreds of theme marketplace for WordPress, from where you can download any WordPress themes.With the use of premium and free plugins, bloggers can enhance the features of blog. WordPress also has easy options to install themes and plugins. Users only need to browse, install and activate. You will be able to do most of the complex tasks with these plugins. So, you do not need to learn coding for most of the things. WordPress is Search engine friendly by nature and you can improve its SEO by installing freely available plugins.. If we compare it with Blogspot blogs or other blogging platforsm, WordPress gives better SEO options. You can also enhance your WordPress blog SEO by using some popular WordPress SEO plugins. Comparing WordPress and blogger’s BlogSpot blog, WordPress offers many options to optimize your blog for search engines. But in blogger there only few options which are not going to help you. In WordPress, you also have full control over the code, so you can do whatever you want. You can optimize images, content easily. Self-hosted blogs helps bloggers to gain respect and trust. It shows that you are seriously into business. There are many popular advertising agencies like BuySellads, doesn’t approve Bloggers using BlogSpot or similar free blog services. There are many advertising plugins available which allow users to easily inject ads inside the blogs at different positions. Many ad networks including Google Adsense now offer dedicated plugin that makes it easy to put code on the blog. So you have full control over it. With full control, you can easily perform A/B testing to improve your earnings. If you are using Blogspot blog, selling blog is not easy. The same case it with the other free blog hosting platforms. But you can sell your self-hosting website. You have full control and ownership over your blog. Free blog hosting platform may add restriction any time and even go down. While Blogger like services will give option to move your blog, it is better to be at safer side in advance. So, If you are a blogger using Blogspot service to host your blog, its time to change and switch on WordPress self-hosting. If you are not sure how to migrate your website from Blogger to WordPress, you can contact me. Do you think having a blog on blogger is better than WordPress? Share your views with our readers.